This pigment creates glowing shadows with interesting granulation. 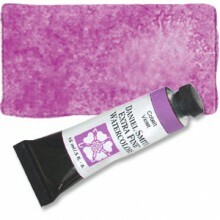 An inorganic pigment, it is considered transparent, low-tinting and ideal for glazing methods. Cobalt Violet's ability to create soft edges, to lift and to mix readily makes it a valuable contribution to watercolor palettes. Click the button below to add the Cobalt Violet Series 3, 15ml Tube Daniel Smith Extra Fine Watercolour to your wish list.